Ronald Ray Sisco, Sr., age 66, long time resident of Ponca City, passed away Saturday, November 17, 2018 at 5:27 p.m. in Tulsa, Oklahoma. Friends and loved ones may pay their respects at the funeral home on Sunday, November 25, 2018 from 1-8pm with the family present to greet friends from 2-4pm in the chapel at Trout Funeral Home & Crematory. A ceremony to gratefully remember Ronald's life will be held at 10 am Monday, November 26, 2018 in the Chapel at Trout Funeral Home. Following the ceremony, Ronald will be laid to rest with his family at the Woodland Chimes Cemetery in Cleveland, Oklahoma. Casket bearers will be Chad King, Christopher King, Hunter King, Timothy Sisco, Justin Mullennax, Jerrald Smith and James Dale Smith. Arrangements are under the direction of Trout Funeral Home & Crematory. Ronald was born on August 15, 1952 to Russel T. Sisco and Maggie E. Mizell Sisco in Ponca City, OK. He was raised in the Marland area, graduating from Marland High School in 1971. After high school, he worked for the Ranch Drive and Kildare COOPs as a grain elevator operator. Later, he worked at ANCCO from 1978-1983 and then joined MALCO where he has worked since that time. His life was forever changed when he met his sister Denise's best friend Cheryl Cook. Ronald and Cheryl were married on December 31, 1977 in Ponca City, celebrating 40 years of marriage and were blessed with 2 children. Ronald was larger than life in many ways. His stubbornness was legendary, but well tempered by his selfless, hard working, and silly demeanor. 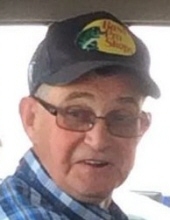 When he wasn't tending to the machine shop, Ronald enjoyed mowing his yard, raccoon hunting, fishing, and walking his dogs Lucky and Sandy, as well as watching horse races, OSU Cowboys and Pittsburgh Steelers Football. However, nothing brought as much joy as spending time with his beloved grandchildren. Survivors include his wife, Cheryl Ann Sisco of the home, daughter, Rhonda King and husband, Chad of Ochelata, OK, son, Ronald R Sisco, Jr. of Ponca City, grandchildren: Brittany King, Hailey King, Christopher King, and Hunter King of Ochelata OK; siblings: Dorothy Smith of Sand Springs, Carolyn Barnett and husband, David of Ponca City, Donald Sisco of Ponca City, Lonnie Sisco of Ponca City, Connie Mullennax and husband, Terry of Ponca City, Kenneth Sisco of Ponca City, LaDonna Sisco of Marland, Larry Sisco of Ponca City, Cathie Sisco of Ponca City, Cindy Sinor and husband, Jim of Marland, Terry Sisco of Marland, and Tamie Schneeberger and husband, Jerry of Lamont, OK , sister-in-law, Fran Wilson and husband, Roger of Oklahoma City, brother-in-law, Lloyd Cook and wife, Evon of Oklahoma City as well as numerous nieces, nephews, cousins and dear friends. Ronald has been reunited with his parents, sisters, Denise McClaflin and DeAnna Sisco, brothers-in-law, Darwin McClaflin and Jimmie Smith, sister-in-law, Diana Sisco, and mother-in-law, Bonnie Cook, and sisters-in-law Marcella Sanders and Darlene Mattox. In lieu of flowers, please make donations to the National Stroke Association. To send flowers or a remembrance gift to the family of Ronald Sisco, please visit our Tribute Store. "Email Address" would like to share the life celebration of Ronald Sisco. Click on the "link" to go to share a favorite memory or leave a condolence message for the family.